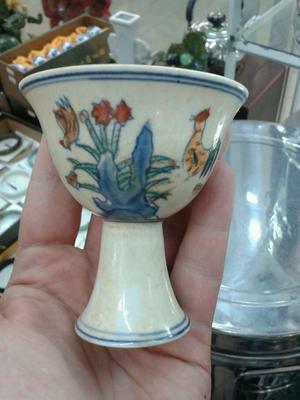 Can anyone help with information on this stem cup please? There is a language barrier between myself and the Malaysian tea shop owner, so I know nothing about it.. Is it a recent piece? Couldn't agree more. I saw the item and liked it, so asked for information as I knew nothing about it. A bit of research later and I see it is a copy of a very rare item, only a few around the world in museums! Should have checked into it before posting on your site. Sorry for wasting your time, but thanks for the speedy reply. In my view this is a fake. There are too many things wrong with it. 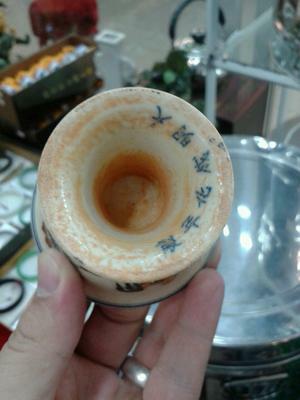 E.g., the shape of the stem, the interior of the stem, the low quality of the painting. This is trying to imitate Ming, Chenghua doucai porcelain, which was/is very expensive and delicate, quite unlike this one. I don't think this item does real antique doucai items justice.